Eternity Summer 2016 ~ "Vibrant. Refreshing. Exotic. Cool palm tree accord on top evokes a captivating tropical paradise. Exotic frangipani flowers envelop the heart with an alluring floral femininity. Sensuous musk accords linger on a warm dry down. Concept: Bright. Cool. Calm. Off the grid. Just the two of you, surrounded by the sleek sophistication of a poolside paradise. Bathed in brilliant sunlight, palm leaves dance in the ocean breeze, waves crash, bodies embrace. Together your dream is illuminated against a horizon of infinite blue." $66 for 100 ml Eau de Parfum. Eternity Summer Men 2016 (not shown) ~ "Exhilarating. Fresh. Sensual. Crisp cilantro on top opens with a burst of freshness and a cool tropical feel. A salty accord and the essence of ocean air brings a breezy vibrancy to the heart. Soft cedarwood at the base finishes with a warm masculine sensuality. Concept: Bright. Cool. Calm. Off the grid. Just the two of you, surrounded by the sleek sophistication of a poolside paradise. Bathed in brilliant sunlight, palm leaves dance in the ocean breeze, waves crash, bodies embrace. Together your dream is illuminated against a horizon of infinite blue. " $72 for 100 ml Eau de Toilette. 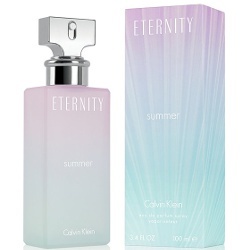 Calvin Klein Eternity Summer can be found now at Dillards. I like that bottle for a summer fragrance. I wonder how it looks in person. I never buy perfumes for the bottle, tho, so may actually make an effort to sniff this one. I like that bottle too! Don’t think I’ve ever liked any of this series though. I remember smelling a summer flanker of either Eternity or Euphoria, several years ago, and being pleasantly surprised.